Amazing question on Twitter yesterday. @Trianglemancsd My daughter learned at school that the core unit of a pattern has to repeat at least three times to be a pattern. Do you agree? The reason this particular question came my way is that I’m working on the next book, which will be about patterns and have the same spirit as Which One Doesn’t Belong? and How Many? In the coming weeks, I’ll work out some of the relevant ideas in this space. I invite you to play along in the comments, on Twitter, and by using anything I share here and reporting back (If you’d rather keep your ideas, critiques and wonderings private, hit me up on the Ab0ut/Contact page). First up, I need to share a bit of research. Young children are able to succeed on a more sophisticated pattern activity than they are frequently encouraged to do at home or at school. This is an important conclusion of some recent research [paywall], and it matches the kinds of findings that are common when researchers look seriously at the mathematical minds of young children. The researchers argue that you can successfully complete these tasks without actually engaging in any kind of mathematical thinking. If you put down a pattern of alternating red and blue tiles, then ask me to make your pattern using red and blue tiles, I don’t have to notice or analyze that pattern; I just have to place a red tile next to each red one, and a blue tile next to each blue one. Similarly, I get into the rhythm of “blue, red, blue, red” and continue the pattern without ever explicitly dealing with the repetition of “blue red” as a distinguishing feature of the pattern. That’s the less sophisticated patterning work that children encounter at home and school. So what are the more sophisticated tasks they can be successful with? I make a red-blue pattern just as before, but I give you things other than red and blue tiles. I ask you to make a pattern like mine. Maybe they are different colored tiles; maybe they are also entirely different objects. Either way, you cannot just match my pattern; you have to notice the structure of the pattern and reproduce that structure with new materials. I make a tower of red and blue cubes, and I ask you to make the shortest tower you can that still has my pattern. This task also forces you to notice the structure of the pattern rather than simply matching the original. Before I read this research article a year ago, the book’s working title was What Comes Next? and I was struggling a bit to make this question have multiple correct and meaningful answers. The current working title is What Repeats? and I’m having quite a bit of success generating conversations with images such as the following. What patterns do you see in each image? What repeats, and how? I am working on my next book from Stenhouse, a counting titled How Many? I took a little time away from that this summer to work on a set of shapes posters. I designed them, Tracy helped me refine them, and the Stenhouse production team made them beautiful. Most of the shapes posters available to teachers are very very bad. (Seriously…go ahead and do a quick image search on shapes posters….I’ll wait.) Everything is in standard orientation; the triangles are mostly equilateral; the rectangles never are, and on and on. The Which One Doesn’t Belong? 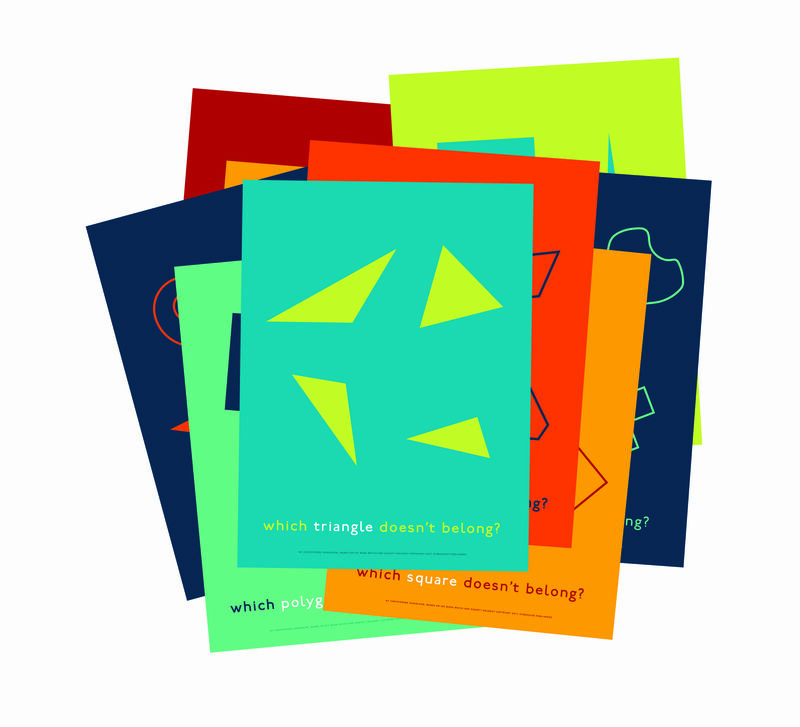 shapes posters are mathematically correct, and they also give everyone in the room something to think about. Why is there a square on the rectangle poster? Is a heart a shape? What about a spiral? Does a curve have to be curvy? Does biggest count as a property? These are the kinds of questions I meant these posters to elicit, while still serving the noble purpose of being a visual reference for important geometry vocabulary. I am very excited to see these posters out in the world. If you’ll help me spread the word that they exist (and where to find them), I’ll do two things: (1) Express my heartfelt gratitude, and (2) Put your name in a drawing for one of two classroom math play sets. Tweet a photograph of these posters in the wild to the #wodbposters hashtag. Design your own Which One Doesn’t Belong? poster and tweet a photo of it to the #wodbposters hashtag. You may have someone else tweet or write on your behalf. This is totally fair. Entries end at 11:59 p.m. Central Time on November 1. Winners will be notified by whatever means they entered (I’ll tweet you if you tweeted; email if you submitted through the contact page), and we’ll connect at that time to work out a shipping address. A classroom math play pack includes Tiling Turtles, Spiraling Pentagons, Curvy Truchet Tiles, 21st Century Pattern Blocks, and maybe something else, depending what prototypes I’m playing around with when I put the packs together. If you have already tweeted a photo of the posters in the world, you probably didn’t use the #wodbposters hashtag, which is how I’ll search for them when the drawing comes to an end, so you’ll need to do that if you want to be entered. Got questions? Hit me with them in the comments! Let me tell you a quick story. A number of years ago, I was for the first time working with an immigrant population that was new to me. I had questions. I asked those questions of a colleague who had been working in this school for a number of years, hoping that he might have insights for me. Instead, my every question was met with “Why are you asking this about this population when you might also see this behavior in the majority population?” with an insinuation that my even asking questions involving race and culture could be seen as indications of racism. There is a certain brand of white liberalism that believes discussing race to be racist. Here is a book recommendation: Good White People by Shannon Sullivan. My major takeaway from this book is that if we don’t talk to our children about race, someone else will. Do you know which white people can be counted on to talk about race to our children? The folks who turned out with torches in Charlottesville last weekend will be more than happy to talk to our children about race. It is important that white people with love in their hearts do so too. Just as we can talk about math with our children without always having the right answers, we can talk about race with our children without always having the right answers. Just as our children don’t have to get every math idea correct the first time they encounter it, they don’t have to nail every nuance the first time they encounter it either. These are challenging times. This is an important book. White people need to read it. Two and a half years ago, I was developing Which One Doesn’t Belong? (before Stenhouse had signed on to publish it). I went on a tour of elementary classrooms to talk with K—5 students all around the Twin Cities about these collections of shapes. I learned a tremendous amount of course, and much of that learning went into the Teacher Guide (which Stenhouse convinced me needed to exist). I learned a lot, and I also noticed something. Most of those classrooms had some form of shapes posters on the walls. Triangles, rectangles, squares, and rhombi were proudly and prominently displayed so that students would be surrounded by correct geometry vocabulary. Most of those shapes posters had something important (and unfortunate) in common with the shapes books in the school library and in the children’s homes. This summer, Stenhouse is helping all of us to fix this. You can now preorder Which One Doesn’t Belong? shapes posters. They come as a set of eight, with an insert in the spirit of the Which One Doesn’t Belong? Teacher Guide to help you facilitate student thinking and classroom conversation as they hang in your classroom. 1. Which SQUARE doesn’t belong? 2. Which RECTANGLE doesn’t belong? 3. Which RHOMBUS doesn’t belong? 4. Which HEXAGON doesn’t belong? 5. Which TRIANGLE doesn’t belong? 6. Which POLYGON doesn’t belong? 7. Which SHAPE doesn’t belong? 8. Which CURVE doesn’t belong? These posters are filled with good mathematics. Consider the triangle poster on top of the pile. The triangle in the lower right is the only right triangle. The one in the upper right is the only equilateral triangle. The one in the upper left is the only isosceles triangle (or is it? do equilateral triangles count as isosceles?) The one in the lower left is the only one you can’t build out of the triangle in the lower right. Students will notice side lengths, angle measures, orientation, composition and decomposition, and more properties of triangles. Some will complain that not all of them are triangles (“too pointy” or “doesn’t have a bottom”). These posters let you and your students sit with—and play with—these ideas over a period of weeks or months. So as you plan your back-to-school classroom organizing and decoration, I hope you’ll consider making space on your walls for these posters. And I definitely hope you’ll share your students’ ideas here and on Twitter. Available for pre-order now. They’ll ship in early August. 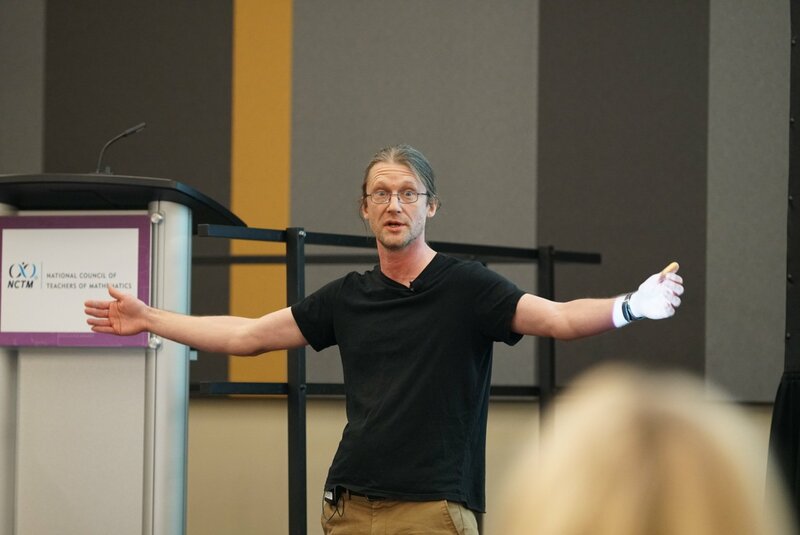 I gave a talk last week. This talk had a click-bait title, for which I am apologetic. The New Basics: Arithmetic and Algebra with 21st Century Tools. Here is the planned text of that talk. It should bear more than surface, but less than perfect, resemblance to the actual text of that talk, which exists nowhere but in the minds and memories of me and the attendees. What do students need to know about arithmetic and algebra, and how can digital tools support their learning it? I’ll show you our last task first. The place where we’ll end up in 45 minutes or so. 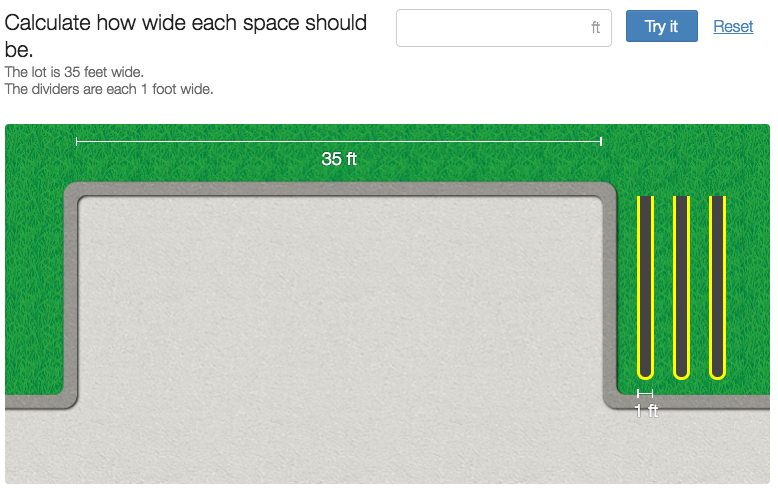 You have a 35-foot wide parking lot and three 1-foot wide dividers to place at regular intervals. The size of the intervals is controlled by what you type in this box. The question we’ll consider is “What is the idea thing to type in this box?” or “What is the best answer here?” Keep that in the back of your mind as we work together this morning. My talk today has four chapters; each anchored by a task. Each task is facilitated by 21st Century tools. I would not have been able to do these tasks as we’ll do them in my middle school classroom in the year 2000. But first a prologue. 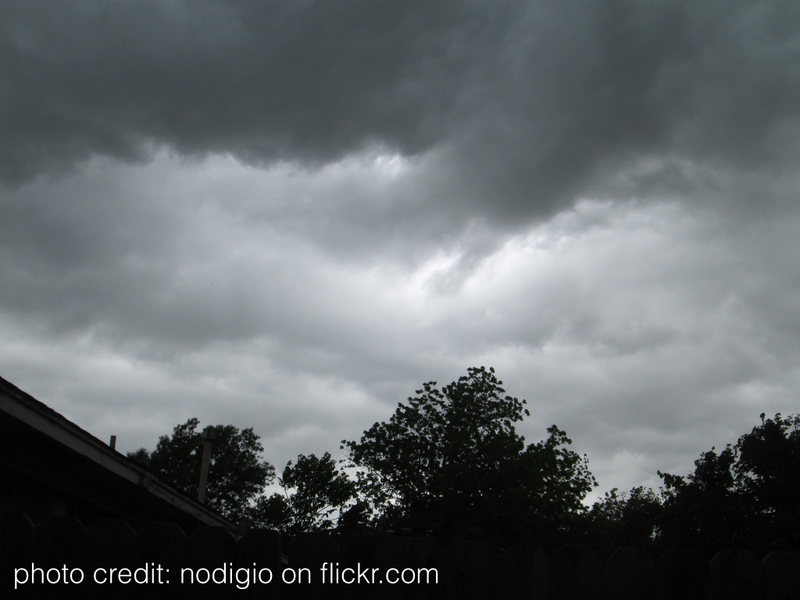 I feel like most slides featuring storm clouds are metaphorical. These are literal. One day when my daughter was 7, we were standing at the window at the top of our stairs, watching storm clouds roll in. Another silent moment passed and she offered this simple observation. 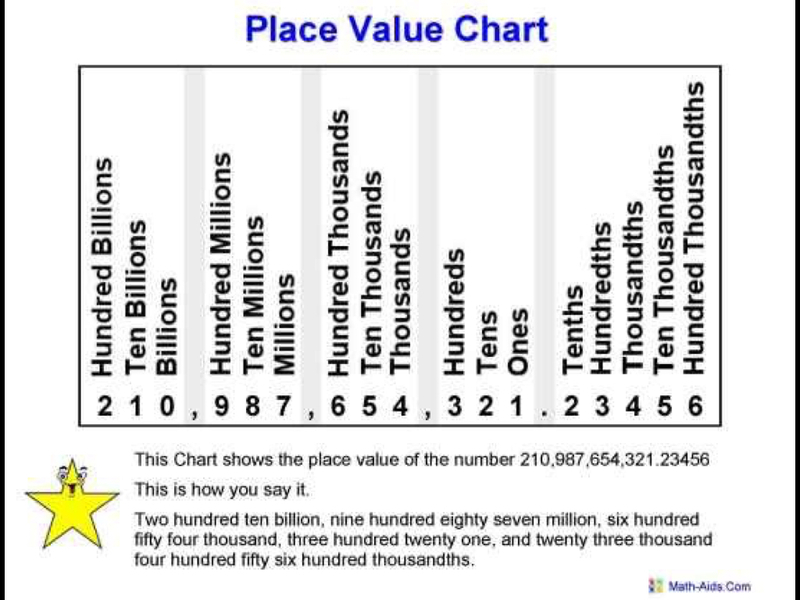 The trouble with place value is that a claim such as this one sounds simple and obvious but is in fact deep and profound. You can learn to name the places without noticing or being able to use the underlying structure. 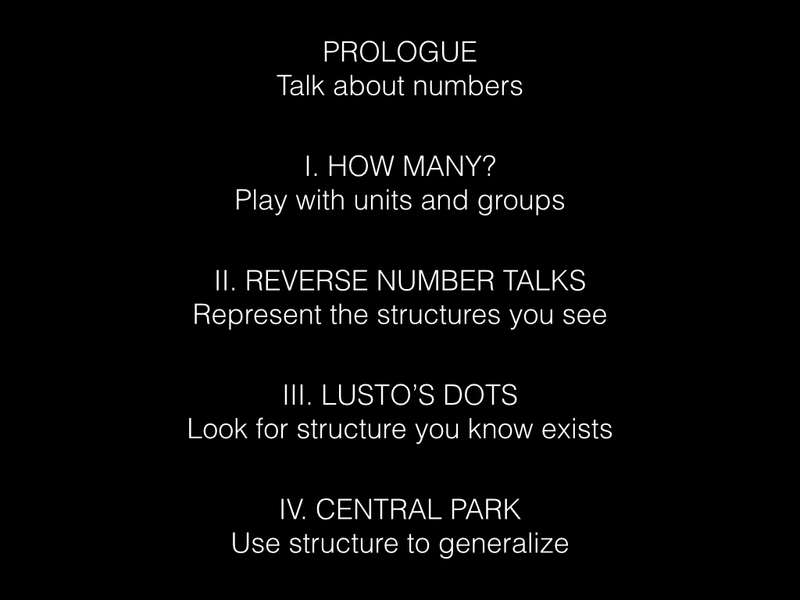 This is a talk about the structure of numbers. We will look at a bunch of tasks together that are designed to bring out number structure. Here’s an example of a task that attends to number structure. How many eggs in each photograph? How did you count them? Here is an example of a task that does not attend to number structure. What prevents attending to number structure? This is the bulk of my 10-year-old daughter’s experience using technology for math in school, and I think it’s safe to say that resonates with many children and parents. Not all, of course, but I have no reason to believe my daughter’s experience is either unique or rare. But if we step back a little bit and look at the situation with a critical eye, we’ll notice that we tend to have computers teach children to do what computers themselves do better—they are teaching children to compute. And there is value in that. But in the words of Papert, we are using the computer to program the child. But if the sum total of the outlay of millions of technology dollars in our public school system is somewhat less distasteful arithmetic instruction, then we need to revisit our priorities. Papert wanted the child to program the computer; a worthy mission about which someone else is surely speaking at this conference. I’ll take us in a different direction. I want to share with you some ideas for using computers to open conversations in classrooms. Conversations that allow for deep and rich exploration and observation. I’ll share with you examples of instruction that uses new tools to teach things that computers don’t do well, and that are essential to using mathematics in whatever fields our children end up pursuing. We’ll focus on multiplicative structure because it’s the key to so many things—place value, algebra, two- and three-dimensional measurement. The thing I have learned in recent years about multiplicative structure is that children’s experiences lay the foundation long before they study multiplication formally in third or fourth grade. We can and should build on this foundation. Here’s one way to do that. There are some here who know my Twitter habits; I’ll ask you to bear with us for a moment while I catch the rest of the folks up. One of the key ways that educators use Twitter is chats. A chat is typically a scheduled thing; every Thursday at 8PM Eastern time is an elementary math chat, for example. Someone organizes the conversation by feeding questions to the group, People respond to questions and respond to the responses. By the end of an hour, many subconversations have added up to a semi-cohesive whole. Some people participate actively; others just read along. There are no requirements or memberships. The technology for organizing all of this is the hashtag. 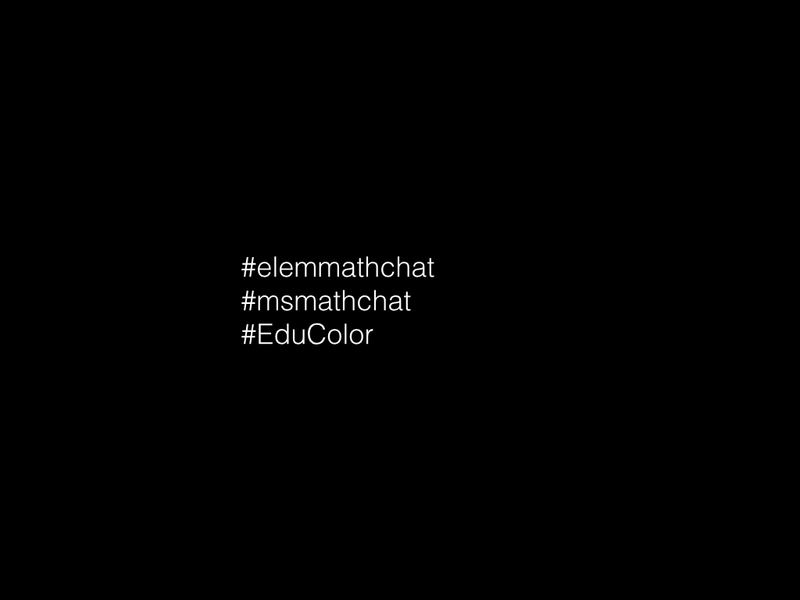 #elemmathchat is attached to every tweet in the conversation and you set your TweetDeck to follow that hashtag. Because chats are organized with a hashtag, they tend to spill outside the bounds of their scheduled times. Once I know who tends to attend #elemmathchat, I might also attach that hashtag to a question or observation I happen to have on a Monday morning in the hopes that one of the regulars will notice it and we can have a conversation. There is a middle school math chat. There is a terrific diversity and equity conversation that doesn’t call itself a chat, but which all educators need to know about and read along with—#EduColor. I’ll take a brief moment to address my white colleagues directly. #EduColor is a terrific place for us to do a lot of listening before speaking, and it is a place that requires an open mind and an open heart. At one point I began to play with the idea of increasingly specialized chats and began to amuse myself this way. I have been fortunate to have made one of these stick. #unitchat. I started with situations where units were missing or wrong, but have progressed to using it mostly to point out situations involving ambiguous or multiple units. Here’s where I am now with this. Let’s look at a few images together, and each time I’ll ask a simple question—How Many? If your instinct is to ask How many what? in return, then you’ve got the idea behind the task. This is about counting, and paying careful attention to what it is that you’re counting. 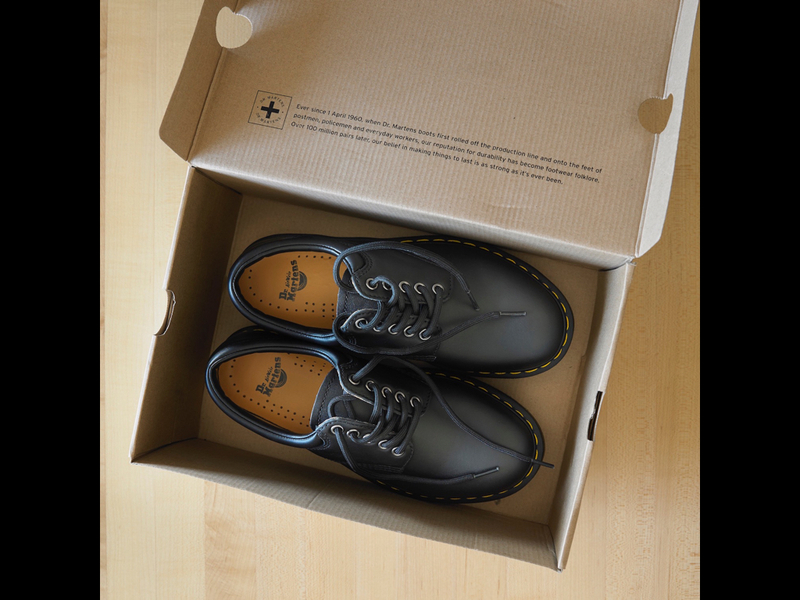 Shoes–Two shoes, one pair. When we can express the same count in two different units, we’re building multiplicative structure. For every pair, there are two shoes. A pair is a group; a unit. It’s a thing you can count. 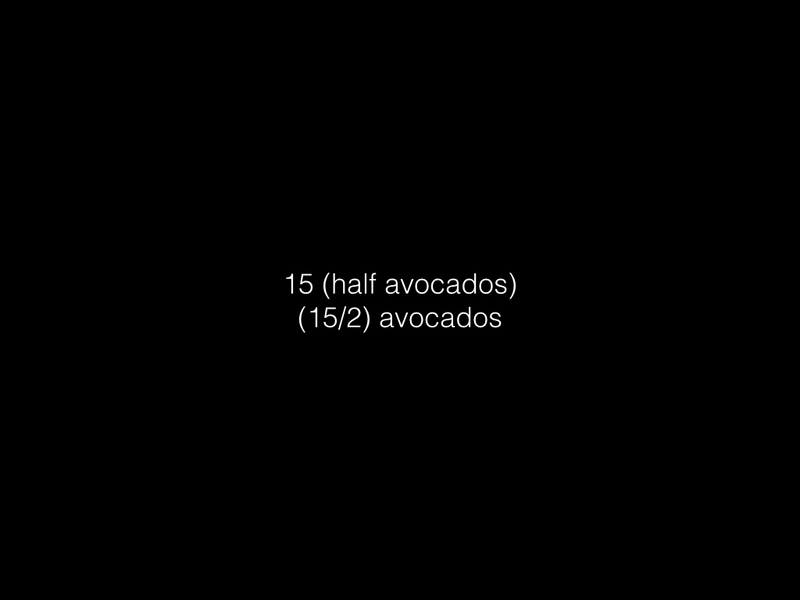 Avocados–15 (half avocados); (15 halves) avocados; half of 15 avocados. Multiplication is commutative and associative. Wnen I left the public school classroom in the year 2000, I was not able to take photos such as these and bring them to the attention of my students. The math I saw in the world stayed in the world and could not come into my classroom. Similarly, the math they saw in the world stayed out there. Now when I visit classrooms, they have projectors attached to computers. We can all see exactly what I saw. We can have a shared experience with an image with no more effort than opening Dropbox on my phone and computer. Similarly, social media allows me to bring the mathematics other people see into my classroom. That avocados picture is adapted from one that someone sent me through Twitter a few years back. 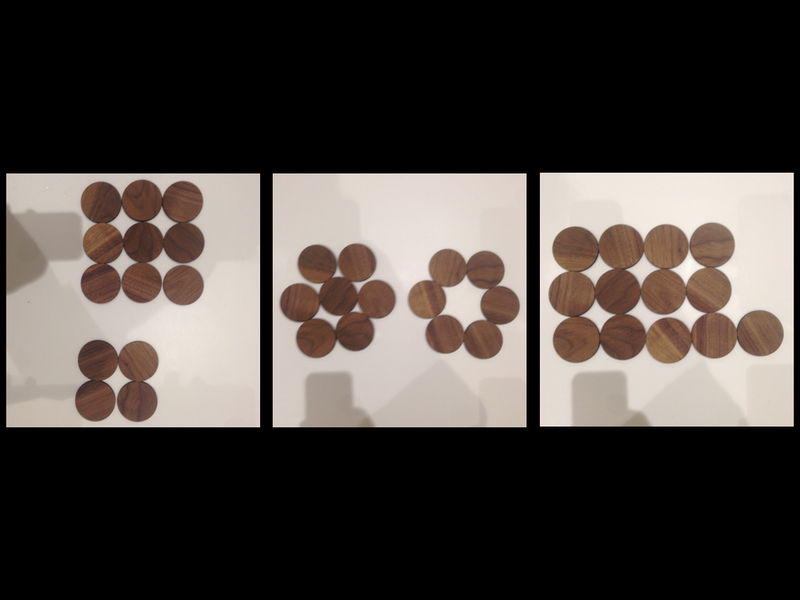 Here are 13 wooden circles. Imagine for a moment that this is a workshop not a session, and imagine that you can reach out and touch these 13 circles. Make or imagine some interesting arrangement with them. On a piece of scrap paper, or in your notes, or on your iPad, sketch the arrangement you see in your mind. Share with a nearby partner who hopefully has made a different interesting arrangement. Record it and continue. Keep going for a few minutes. DO NOT change your number. Your goal is to see your number in as many ways as possible. 21st century tools. I have a couple of things to say here. One is that it matters that these are circles. I can show rows and columns with circles, and I can also show 7 as a hexagon with a center. I can’t do that with the plastic square tiles that were in my classroom in 1999. 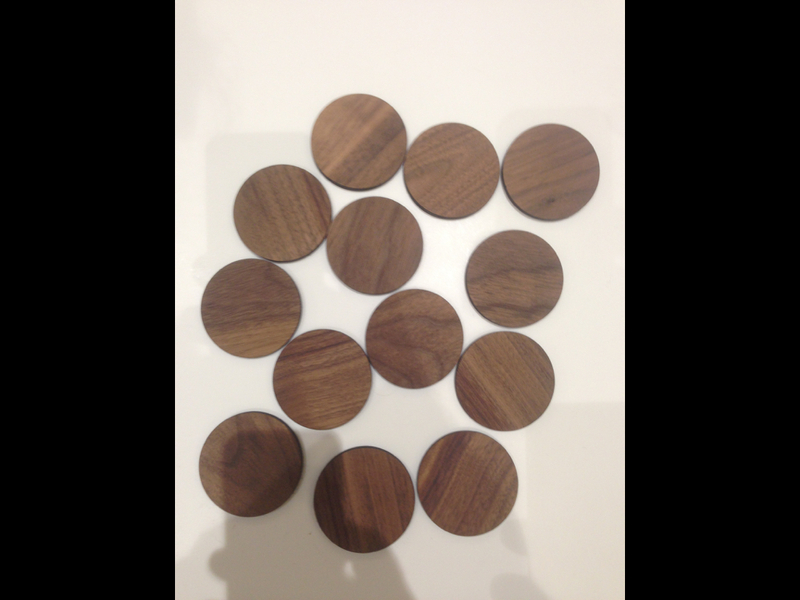 But if I have access to a laser cutter, I can turn $2 worth of walnut into 20 circles over the course of 15 minutes. The other thing I’d like to say here is that 21st century tools complement older ones, but need not always replace them. Yes, children enjoy brightly colored screens and virtual worlds, but they also enjoy things are subtle, beautiful, and tactile. A view of the world holding that children require electronic stimulation in order to be engaged is a cynical one. Knowing the structure exists allows you to look for it. Here’s a pretty thing my colleague and friend Chris Lusto made recently. How many dots? How do you know? There are 12 dots, and I noticed quickly that there’s a point where those 12 dots are pretty clearly separated out as two sets of six. Quickly make a list of other ways you know of making 12. Let’s start with 3 times 4. 12 is 3 times 4, and I’ll think of this as three groups of four. Let’s watch and I want you to shout when you see three groups of four. And we could look for four groups of three, and six pairs, and 7 plus 5, etc. There is something really satisfying to me about finding a structure I know should exist, but which isn’t revealed at first glance. On screen 5, what do you want to type in that box? Two alternatives: a number, and an expression. What we’ve learned from teachers is that if structure isn’t something you’ve studied, you can’t move beyond guessing and checking. But guessing a number and adjusting it doesn’t generalize. Structure generalizes. An eighth grade teacher with a classroom full of guessers can do her level best to remediate with additional experiences with structure. 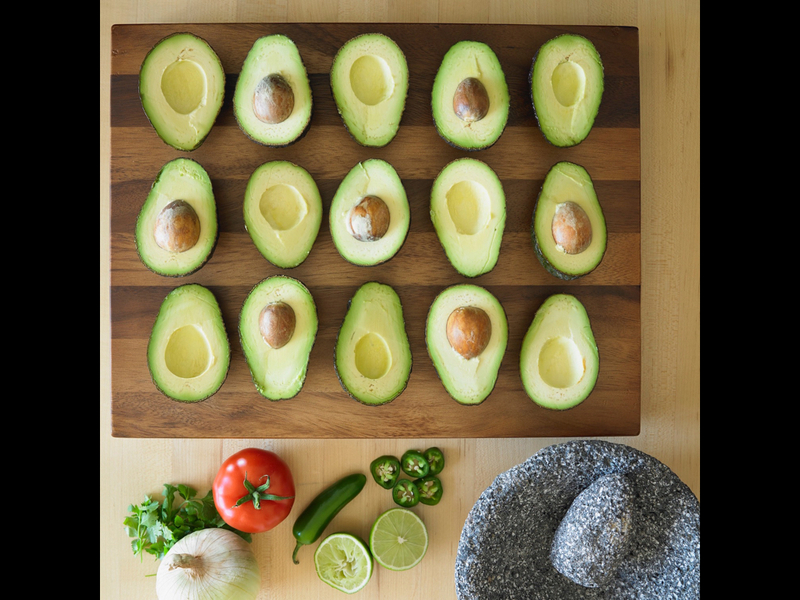 Number talks are useful tools in high school classrooms, and I recently spent a delightful 10 minutes with a College Algebra class noticing the associative property in the language we use to describe the avocado picture. But structure starts earlier. Like language, it needs to build over time through repeated use, incidental noticing and deliberate exposure. 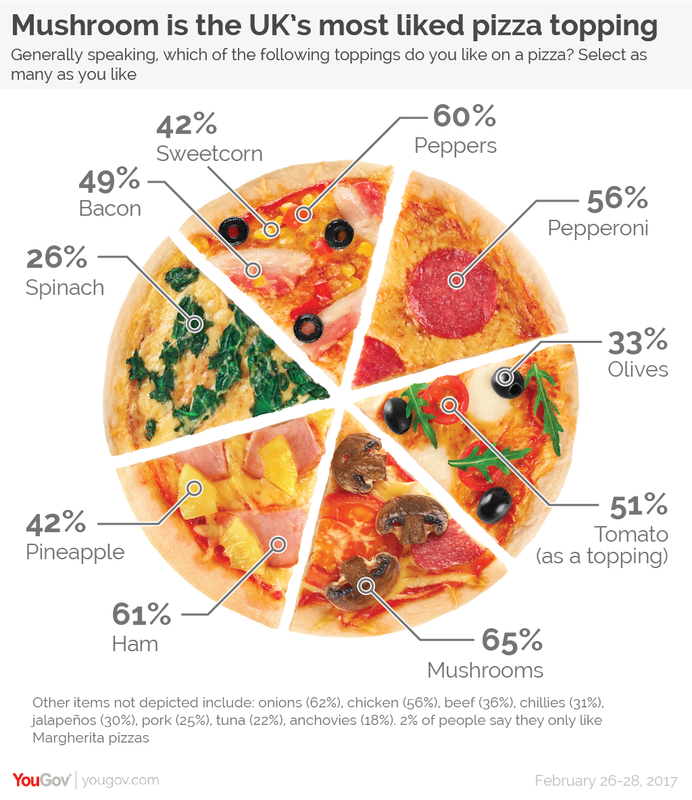 A Truly Unfortunate Representation of Data accompanied a recent article on British pizza toppings. So much bad data representation wrapped into a single image. Make sure to read the fine print! What if you reflect over a circle? 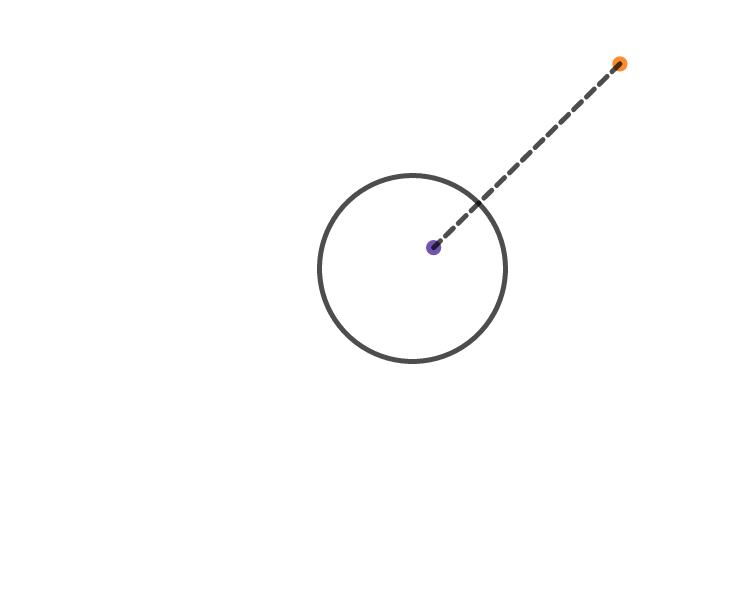 I played today with the circle I understand best—the circle of radius 1, centered at the origin. 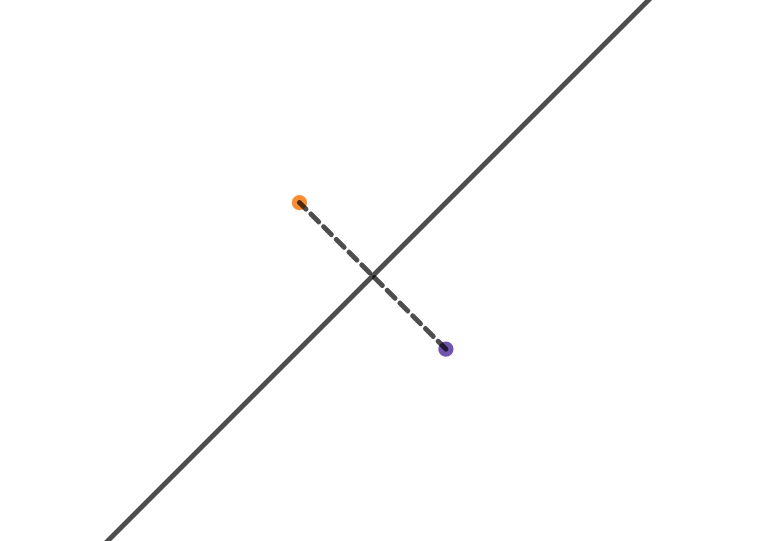 You still want the line segment to be perpendicular, which is tricky enough. But distance gets messy. Reflecting over a line means taking everything on one side of the line and matching it to something on the other side. Easy to do with two half-planes. But with a circle? You need everything outside the circle to match up with everything inside the circle. The basic idea is a point outside the circle will match up with a point inside the circle, and that their distances will be reciprocals of each other. If the original point is 2 units from the origin, its reflection will be 1/2 unit from the origin. 3/4 matches with 4/3, 5 with 1/5 and so on. Whether infinity and zero match up is open to interpretation and not important right now. Here’s what this looks like. Go play with the graph. 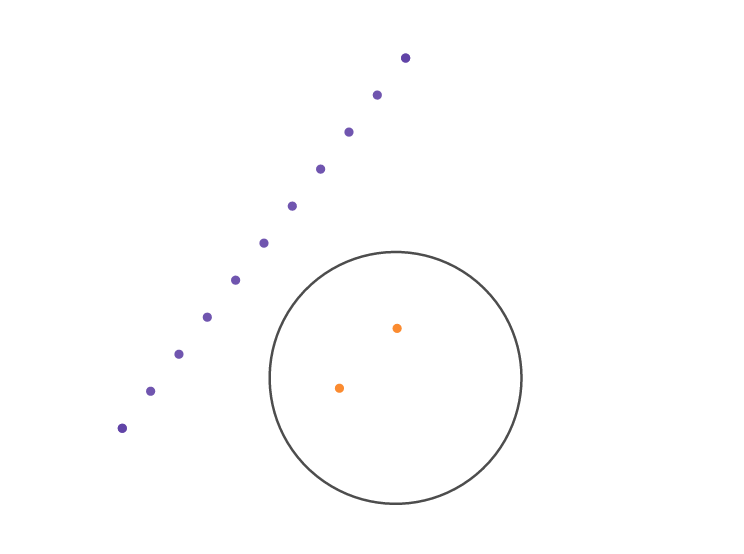 Move the orange point around and start to get a feel for the relationship between the original and its reflection. What does the reflection of the in-between points look like? Imagine it. Sketch it. Then go see.